I have to admit to you I have been in the mood for some comfort food. It’s kind of gloomy out and when the clouds appear I am in the mood for cozy. So today I thought I would share with you one of my favorite comfort foods, homemade mac & cheese. No, not the stuff in the blue box, but the stuff made with milk and real cheese. 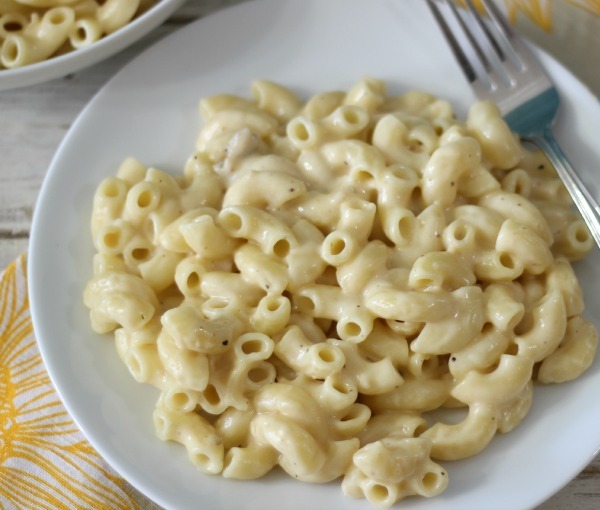 This macaroni and cheese, is creamy, flavorful, full of cheesy flavor and ohhh, weeeeee I love it! I of course lightened it up a little bit because after all this girl is trying to watch her waistline. To lightened it up I used non-fat milk and reduced fat cream cheese to thicken it up, but I did use full fat sharp medium cheddar cheese for the star of this dish. I debated about using reduced fat cheddar cheese, but I really wanted a cheesy, real flavor. Sometimes you do need to splurge. After making this dish, I came to the conclusion what traditional mac and cheese is for calories, and I think it can be kind of scary. So thank goodness I came up with this recipe. This recipe makes 6 servings at about 1 1/2 cups, which is simply perfect. It’s very filling and makes for a wonderful side dish or as a main dish if you’re having it for lunch. After making this dish I also realized how you can really zip it up. If you’re not a fan of cheddar cheese, I bet a spicy pepper jack cheese would be fantastic and maybe throw in some jalapenos and maybe even some chicken. You know my mind is spinning with all of the possibilities. 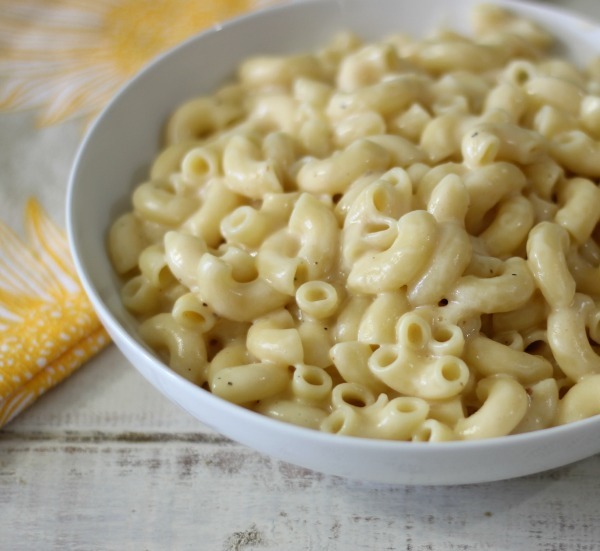 Creamy, cheesy, quick, lightened up homemade macaroni and cheese. Cook noodles according to direction. Once cooked, drain, rinse with cold water, set aside. 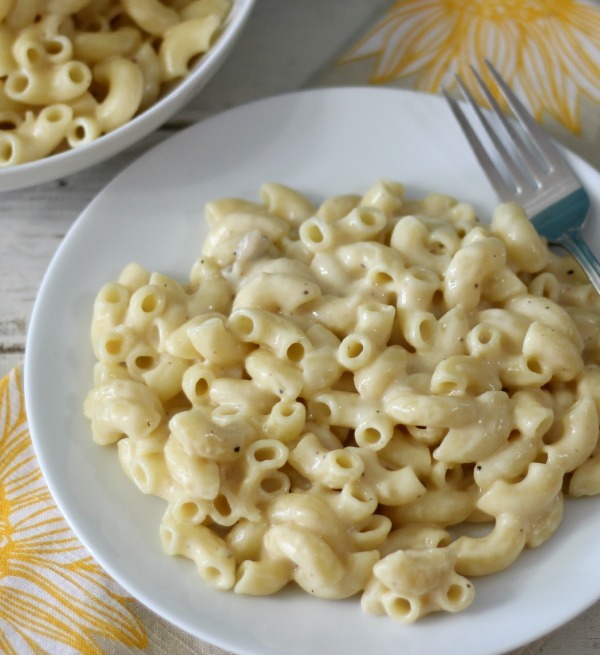 While noodles are cooking, start the cheese sauce. In a large pot add flour, salt and pepper, stir in milk. Drop in cream cheese a teaspoon at a time; whisking until melted, bring to a boil. Reduce heat and let it simmer for 2 minutes. Stir in cheddar cheese, until melted. Taste test it, I felt I needed to add a pinch more salt & pepper. Add cooked noodles to cheese sauce and mix until combined. I have to admit as a kid I never liked homemade mac and cheese. It had to be the box stuff. 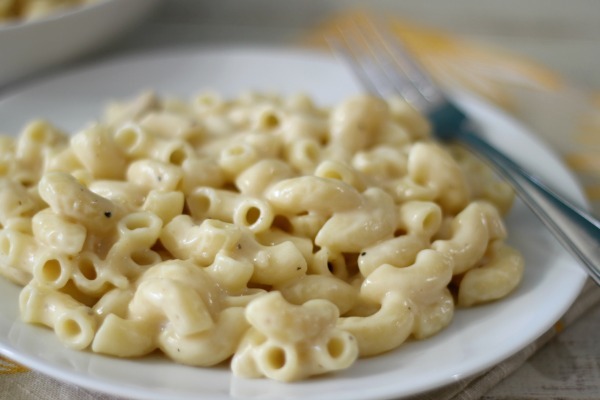 I didn’t even like Velveeta mac and cheese, but as I got older I really appreciated homemade mac and cheese. I mean nothing really compares to the homemade kind. 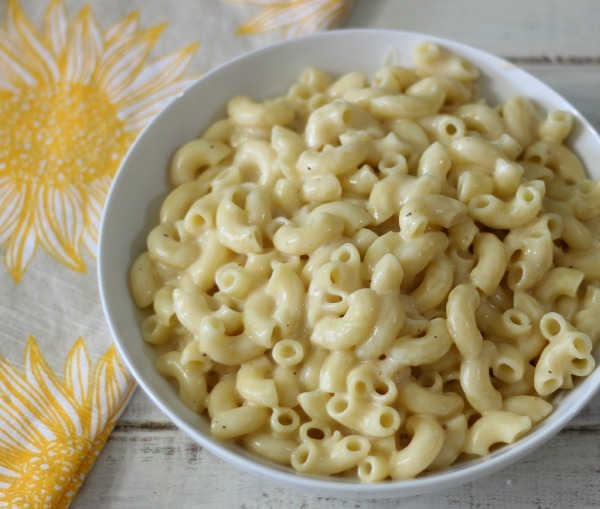 So next time you’re looking for a side dish and craving cheese like I do all the time, whip up some stove top mac and cheese, you won’t be disappointed. Thank you so much! I am so glad you like it! It’s one of my favorites. I make it all of the time.